Beginning Friday, October 24, The Atlantic Dialogues will bring together more than 350 leaders from the public and private sectors in Marrakesh for three intense days of informal, open discussions on issues affecting countries that border the Atlantic Ocean – Europe, North and South America, the Caribbean, and Africa. The event is jointly hosted by the German Marshall Fund (GMF) of the United States and the OCP Policy Center, a think tank supported by the OCP Foundation. It is Modeled after GMF’s Brussels Forum, and participants include senior leadership from government, business, NGOs, media, influential personalities, and others who collaborate through interactive panels and focused smaller sessions on topics addressing “some of the region’s current challenges through both traditional and non-traditional partnerships.” Among the confirmed speakers are public and private sector delegates from Holland, the UN, World Bank/IMF, Togo, the European Commission, Costa Rica, the European Parliament, Science-Po University, Colombia, USAID, and Senegal. To drive these discussions toward concrete proposals, Atlantic Dialogues has enlisted global partners from outside the region to discuss their shared interests and identify potential for collaboration utilizing a broad range of partnerships, including international organizations, NGOs, businesses and industries, think tanks and universities, and other groups. 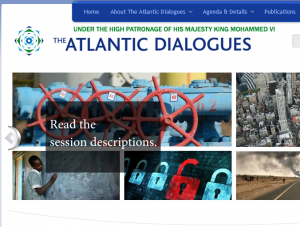 A significant portion of the program will feature participants from The Emerging Leaders Program, which affords rising leaders the opportunity for advanced training in leadership skills followed by participation in the Atlantic Dialogues. This is a clear priority for the OCP Policy Center which, through its Young Leaders Program and other training/mentoring programs, contributes to the development of the next generation of Moroccan and African leaders in the public, corporate, and civil society sectors. Held in a discussion format, with featured speakers as well as discussants, the event’s breadth and scope is illustrated by the program topics. From its initial session on “The New Atlantic Equation: Convergence, Cooperation, and Partnerships,” to current challenges such as “Confronting Zones of Chaos,” “Governing the Atlantic,” and “New and Old Challenges in Health Security,” participants will discuss both issues and possible remedies. Technology, agriculture, e-government, development financing, sustainable cities, gender concerns, and new energies are some of the other major topics to be reviewed. While many of the Atlantic basin countries struggle to build sustainable, inclusive, national development strategies, GMF and Morocco are providing a top tier forum for moving beyond crisis to concrete policies for achieving equitable growth.